Educating supervisors about these five techniques will increase referrals to your EAP. 1) The Casual Encouraged Self-Referral. With this technique the supervisor mentions the EAP as a reminder in response to hearing about a personal problem first mentioned by the employee. No big deal, but still the supervisor plays an appropriate role. No counseling. No diagnosis. Just a mention. 2) THe Strongly Encourage Self-Referral. Here the supervisor mentions the EAP in response to an existing job performance problem hoping the employee will self-refer. No disciplinary action is used or believed necessary by the supervisor. No contact with the EAP is made prior to the corrective interview. 3) The Type 1 Supervisor Referral. The supervisor notifies or consults with the EA P first. The supervisor meets with the employee and requests performance changes. The supervisor then tells the employee that a “supervisor referral” is being made. The employee is asked if he will accept? A release is requested. Supervisor follows up. Straight forward, this referral works for most employees who are in trouble with their performance. THE TYPE 2 SUPERVISOR REFERRAL. The supervisor consults with the EA Professional and coordinates a meeting. The supervisor meets with the employee and requests performance changes. Disciplinary action is promised if changes aren’t forthcoming. The supervisor gives the employee the name of the EA professional and an appointment time offered to the supervisor as a possible choice for the employee. The employee is not required to accept this appointment. It is only a helpful opportunity. The employee will almost always accept the prearranged appointment. THE TYPE 3 PERFORMANCE BASED INTERVENTION: The most powerful and serious supervisor referral. It works virtually every time when done correctly. TI also call this the one minute intervention. Disciplinary action is warranted, known in advance, and administered on the spot if the employee does not accept a supervisor EAP referral presented clearly to the employee as an accommodation and alternative to disciplinary action in the event the employee believes (solely believes!) 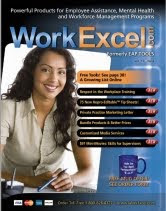 it would be helpful to address a personal problem he or she thinks is affecting job performance. It is the employee’s choice. Management is not "invested" in the decision either way. 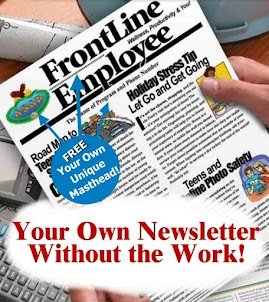 The employee is in complete control of their employment future which ends immediately (or other disciplinary action given) or he or she receives the red carpet treatment and is promised A) complete support for getting help, B) No loss of job or promotional opportunities solely for making a decision to go to the EAP; C) the disciplinary action held in abeyance pending follow through with EAP recommendations. 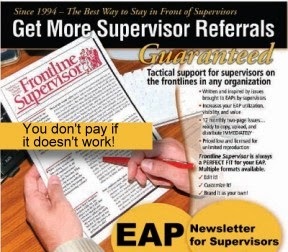 The referral to the EAP is in lieu of termination (or other certain disciplinary action.) The employee feels pressured, but it is his or her decision entirely. There is NO other option. Either the EAP referral is accepted or warranted and justifiable disciplinary action based on the performance or behavioral incident is administered. (Termination will provide the most powerful leverage.) The agreement includes following through with EAP recommendations entirely.